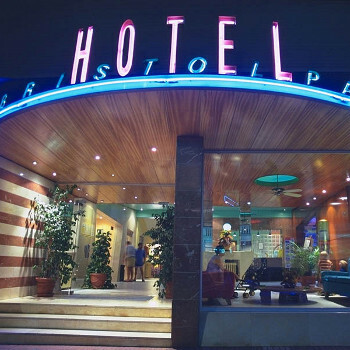 The Bristol Park Hotel is an excellent, well located hotel close to the sandy Levante beach and offers an international atmosphere. On the borders of the Old Town area, with its great variety of shops and restaurants, and with easy access to the New Town area, with its lively nightlife, discos and bars, this Bristol Park Hotel is ideal for families and couples. Before we went we phoned the Hotel to as or a room at the front - The rooms at the back look onto a wall and have no view at all. We were give a room at the front overlooking the road which was great. We arrived middle of the night to find the night porter had kept food for us and he opened the restaurant just for us. the hotle is about 2/3 spanish people but this was ok as the spanish tend not to sit round the pool all day like the brits! Pool was ok and had a small kids splash pool too. Food was fine - even the kids found someting every day. Entertainment seemed ok but we tended to head out every night. Great position right at the end of the avenida de meditteraneo - you can watch the world go by from your balcony. 2 minute walk to old town and 4 minutes from beach. A lot of spanish about at night so we headed to the new town for English pubs and shows. All in all a good hotel. this hotel is nice clean hotel and the rooms are nice and clean we could not fault it we would sta there again its in ideal location for the old town aswell as the new one. Stayed at this hotel for 1 week in June. I do not have a bad word to say about it.Breakfast plentiful and something to suit everyone fruit,breads,english breakfast,cheese,meats.Lunch time always various courses along with salads etc.Dinner time the same.Lots of varied sweets and ice creams.The hotel had only just opened after refurbishment.Brand new bath,shower and sink etc,new fitted wardrobes,new air condition.The flooring was all new wood.Room cleaned daily and towels changed also.We have been to Benidorm on many occasions to numerous to mention and have stayed at different hotels and rate this one among our top 4.The location is in the old town and near to the beach.The shopping area is just beside this hotel.Would highly recommend it.No complaints from us. On arrival at the Bristol Park we were not really impressed with the location. Our room was overlooking what must be the noisiest busy junction in Spain. The room was very clean with plenty towels and adequate bedding. The staff were friendly though some more than others. The bar staff tended to have problems speaking English. The food was ok but tended to cater for the mainly Spanish guests. Plenty of it though, served in a buffet style with adequate choices. The hotel pool was colder than my wife after an argument. Mind you it was January. The prices of refreshments were somewhat on the more expensive side even for a hotel. The Entertainment deserves a five* rating if only for the legendary Mr. Rob Evans. Absolutely great one man and his keyboard, not meant to be funny but he really is. Everything from classical Spanish to Meester Ton Jomes (how he says it) Great. The hotel is situated on a very busy main road and at weekends is very noisy at night. The hotel itself looks a lot better inside, as the looks from the outside dosen't do it justice. The staff were excellent, the pool was very cold, I dived in one morning, and got out sharpish while I still had breath in me. The cleaners were very good and rooms were done regularly. Location of hotel (main road apart) is excellent to get to bars resturants. Entertainment was not to my liking as I went out everynight to take in some shows. Food good and plentifull. I would definately visit again but with a room at the back as the front is very noisy at night. Stayed here for 2 weeks with my family. Rooms were cleaned daily to a high standard. Food lovely, plenty of choice, even for my 12 year old. The hotel is just on the edge of the old town, but this seemed a much better spot for us after staying in the centre of the new town for the last 4 years. Would definitely visit this hotel again, but would suggest to anyone who is thinking of going to request a room at the back as the front is on a main road and is very noisy with traffic. We traveled to Benidorm in September 2003 as a family holiday the hotel rooms were very retro full of orange and browns the hotel staff could not be bothered with us very rarely they smiled. Throughout the two weeks we were there there was two English families including ourselves the rest were Spanish. We were even moved tables to let a Spanish family use it! The pool was freezing and the entertainment was a man on an organ singing Spanish every night. We went out every night and you can easily find entertainment elsewhere. The staff were helpful and some spoke good English. Location although on a main road - we had a room just above the entrance - provided some good entertainment. Entertainment was limited to a guy with his organ so we went out every night. Only down side was the pool which was freezing. We went self catering this year but wished we had gone back to the Bristol Park.